Clients and former clients, prospects, and even outsiders have an abundance of online opportunities to comment – positively or negatively – on your real estate career performance … whether or not they’ve worked with or done business with you! Moreover, because how licensees appear online effectively defines “who they are” to web users unfamiliar with them personally, successfully managing and enhancing your online profile or persona becomes a matter of urgency. The practice of “Reputation Management” is a primary legal issue explored in Polley Associates’ “Legal Issues and Changes 2016” course. Learn how to find what’s being said about you online. Learn how to effectively and legally reply to negative criticisms. Learn more than a dozen different tips to encourage your clients to spread the word online about the excellent representation you provide. Several other topical and timely subjects that may affect how you do business. This is a one-day, 7-hour, live classroom course consists of state-approved topics. No post-course exam is given. It is accepted by, and meets 7 hours of continuing education requirements set by, the Pennsylvania State Real Estate Commission. 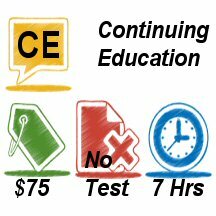 It can be combined with other courses to fulfill all 14 hours of continuing education required by the Commission for a real estate salesperson’s or broker’s biennial license renewal during the 2014-2016 cycle that ends at midnight on May 31, 2016.